During the rainy season Toyon bursts with red berries to feed robins, waxwings and many other bird species. 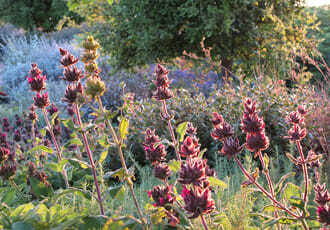 Hummingbirds and butterflies visit, attracted to the pink-velvet whorls of Salvia spathacea. The fragrant blooms of the Arctostaphylos emerge, and wildflower seeds carpet the ground in preparation for the coming season’s new growth.